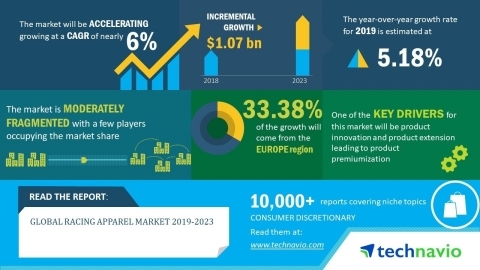 LONDON--(BUSINESS WIRE)--The global racing apparel market is expected to post a CAGR close to 6% during the period 2019-2023, according to the latest market research report by Technavio. Changing consumer demands and a rise in disposable income among racing aspirants has increased the purchasing power of consumers, which has propelled the demand for premium racing apparel leading to the growth of the global racing apparel market. Also, to overcome unfavorable driving conditions, vendors are offering racing apparel products that have the right combination of superior-quality raw materials, which further leads to product premiumization. Hence, increased product premiumization and product line extension of racing apparel and accessories will strengthen value sales of the global racing apparel market during the forecast period. As per Technavio, the introduction of smart products will have a positive impact on the market and contribute to its growth significantly over the forecast period. This global racing apparel market 2019-2023 research report also analyzes other important trends and market drivers that will affect market growth over 2019-2023. Advances in smart technology and the high demand for smart products is compelling manufacturers to innovate and introduce smart racing apparel. Although smart racing apparel products are priced higher than regular racing apparel, the features and convenience provided by smart racing apparel drive their demand among consumers. Manufacturers of racing apparel are engaged in incorporating wireless and connected technology in their products to make the apparel compatible with smart devices, such as smartphones and tablets. For instance, top vendors have come out with features such as NFC-embedded chips that allow users to authenticate that the suit is genuine and can validate the details of the rider such as medical details. Thus, in case of any mishap or accident, medical details of the rider can be retrieved without any delay, and necessary medical assistance can be provided. Thus, with such features, the market is expected to witness a positive outlook during the forecast period. “Apart from the introduction of smart products, the introduction of lightweight products is one other factor that is expected to boost the sales of the global market. Nowadays, consumers prefer lightweight racing apparel compared to traditional racing apparel which is heavy and uncomfortable,” says a senior analyst at Technavio. This market research report segments the global racing apparel market by distribution channel (online and offline), and geographical regions (Europe, North America, APAC, MEA, and South America). The European region led the market in 2018, followed by North America, APAC, MEA and South America respectively. However, during the forecast period, the APAC region is expected to register the highest incremental growth due to the rising number of regional players and an increase in the participation of women. The global racing apparel market will post a CAGR of close to 6% during the period 2019-2023.